Why is BEC5 Curaderm such an amazing treatment option for patients with common forms of skin cancer, age spots or sun spots? Here’s the full story. There may be no scarier word you can hear in a doctor’s office than “cancer.” Even if patients are diagnosed with a treatable or non-malignant form of cancer, they often quickly agree to any treatment the doctor suggests without seeking second opinions or searching for alternatives. Skin cancers definitely fit that description. Melanomas are the most serious form of the disease and can be fatal if not caught and cured early enough. But 99% of all skin cancers are non-melanoma forms, caused by too much exposure to the sun’s UV rays. They are easily treated and cured. The most common type of skin cancer (80% of all cases) is basal cell carcinoma; treatment of these lesions, normally found on the neck or head, is most often done in a doctor’s office or with simple surgery. 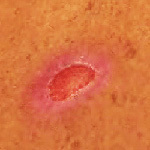 The second most-common skin cancer is squamous cell carcinoma; treatment is similar. Whether the procedures involve electricity, freezing, lasers, cutting, radiation or more-involved surgery depends largely on the size and location of the tumour and how far it has progressed. More than one session of treatment is usually needed. Doctors treat some keratinocyte carcinomas (the name used for both basal cell and squamous cell non-melanoma skin cancers) with topical prescription medications. That’s considered to be a form of chemotherapy because the medicine contains cancer-killing chemicals (which can also kill healthy cells). These drugs can not only inflame or irritate the skin, but cause burning, stinging and residual skin damage which can even require plastic surgery to repair. As a group, these types of squamous cell and basal cell carcinoma treatments are often known as the “cut, poison and burn” approach. They’re the same approaches that doctors use for more invasive or dangerous forms of cancer – and very often, they aren’t necessary. Decades of clinical research and testing have led to the development of a safe, natural alternative, proven to work at the Royal London Hospital and numerous other skin cancer treatment facilities. It’s called BEC5 Curaderm. The active ingredient in this cream is called BEC and is made from natural phytochemicals derived from – believe it or not – eggplants. Those phytochemicals are known as solasodine glycosides and they are able to penetrate tumours. Healthy cells basically ignore them, but cancer cells have a specific receptor that binds the phytochemicals to them. From there, it gets really weird. The BEC is drawn into the cancer cells where it is digested, and that process generates a substance that causes ruptures inside the cells. As a result, digestive enzymes are released into the cancer cells; the cells actually “eat themselves” and are destroyed, without damaging nearby healthy cells. It’s a crazy-sounding process, but explains why BEC5 Curaderm is a far better choice for most patients than cutting, burning, radiation or chemotherapy – those treatments damage all cells, both healthy and cancerous. By contrast, BEC5 only attacks and kills cancer cells. Best of all, it works like a charm. In rigorous clinical tests, BEC5 Curaderm was able to cure nearly 80% of all patients with keratinocyte carcinomas (basal cell or squamous cell non-melanomas) – and follow-up exams showed that the cancer was gone for good. More than 100,000 skin cancer patients have been completely cured with the non-toxic, totally-natural cream after just eight weeks of daily application (which is done at home, not in a doctor’s office). Researchers suspected that BEC5 Curaderm would also be fully effective when used to treat other common skin issues, and they were right. 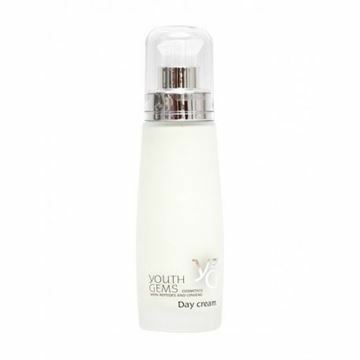 The cream has proven to be ideal as sun spot and age spot treatments, and removal of annoying keratoses and keratocanthmoas. If you read the information at the top of this page, you certainly noticed that a tube of BEC5 Curaderm is quite a bit more expensive than a jar of skin or face cream that you’d pick up at the local store. However, it’s important to put price into perspective. That jar of skin cream from the store isn’t going to do a thing for you if you’re diagnosed with skin cancer. 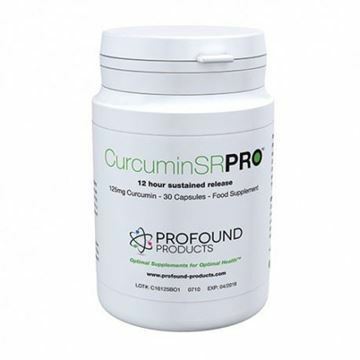 That’s why its price shouldn’t be compared with that of BEC5 Curaderm, which is a proven and effective natural treatment for one of the most difficult diseases there is to cure. Instead, compare Curaderm’s price with what it might cost for multiple doctor visits and minor surgery, or even more expensive laser, radiation or chemotherapy treatments. It’s easy to see that there’s a clear winner. Unlike most medical procedures, use of BEC5 Curaderm causes little or no scarring, and leaves no “dents” in the skin or other cosmetic blemishes. BEC5 Curaderm can be used in the privacy of your own home. No doctor or hospital visits are required, ever. Curaderm’s effects have been proven to be permanent, with no worries of the tumour coming back. The cream contains absolutely no hazardous chemicals or toxins – it’s all natural, with no known side effects. You can keep a tube in your refrigerator for five full years, to be used for age spot removal, sun spot removal or a later incident of non-melanoma skin cancer elsewhere on your body. Less expensive, scientifically proven and impressively effective – it’s no wonder that BEC5 has become the world’s leading choice for basal cell carcinoma treatment and squamous cell carcinoma treatment. With a remarkable plant extract at its heart, curaderm cream is easy to apply – simply rubbed in to the skin at the site of the skin cancer. Bec5 has been praised globally by leading doctors and skin experts as a versatile skin cancer treatment that does away with the need for the surgeon’s knife. To see BEC5 Curaderm in action, watch the video above made by a customer which follows their progress through a full course of treatment with the cream. A 20 ml. bottle of BEC5 can provide enough material to treat one large skin cancer, two medium sized ones, six small ones or twelve sun spots. Please note BEC5 shouldn’t be applied to moles, melanomas or used by those allergic to Aspirin. Curaderm Can Help Save Your Skin! Information provided with the product is correct. You need to be patient and follow instructions. After applying the cream, do not neglect covering it with tape, as instructed. This is not an optional step....it will make a difference in the result. Get the blue tape for sensitive skin. The cheaper kinds are too sticky and leave a residue on the skin. You will notice results quite quickly, but a complete cure of large areas will take time. Many weeks. But it works. It will deal with actinic keratoses and other conditions, both less serious and more serious. It is costly, but it will work where the cheaper ones will not. I recommend BEC5 Curaderm and will continue to use it as long as I need it, and have suggested it to others as well. I've been using this cream for over 2 years as I have a large BCC on my neck that I've had for over 30 years. Hence it is also quite deep. It has created quite a large crater like depression, but it has also searched out more spots near it and has reduced the BCC by over half. I was recommended to a plastic surgeon who wanted to have it removed. This involved a skin graft, and possible damage to the nerve which would leave me with a dropped shoulder, tightening of the neck, and scarring in a number of places. 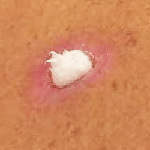 Curaderm is a much better option, and still now continues to find and cure more small spots nearby. An awesome product! Recommended by a Friend and It Works! I purchased this cream on the recommendation of a friend who used it to treat a basal skin cancer. I am near the end of treating a basal on my nose and so far so good. It hasn't even been 3 weeks and already the area where the cancer existed is beginning to heal over. I did a lot of research before buying this cream. My experience follows the same path that has been described by many other users except that it has worked much quicker for me. Only 3 weeks instead of 8. Fight the formation of damaging free radicalsand reduce inflammation. Diabetes – prevents a build of up of fat cells in the liver. Reduce swelling, and inflammation - Arthritis, Crohns disease, psoriasis, ulcerative colitis. Pain Pro - Palmitoylethanolamide 100% pure has been shown to bind to the receptor in the cell nucleus that relates to chronic pain and inflammation. Palmitoylethanolamide has been extensively studied with in excess of 500 Clinical studies that show PEA's effectiveness in chronic pain, neuropathic pain, chronic inflammation and in acute infections such as flu and colds.